One of the finest landscape gardens in the world …. … A National Trust Garden near Stourton, Wiltshire , The United Kingdom …. 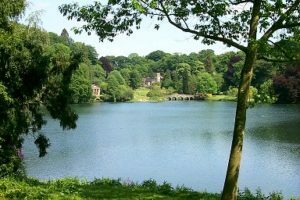 ….. Stourhead garden was created by Henry Hoare II in the 1740s. Entry into Stourhead Garden …. through many flowering trees, grass spaces and lots of daffodils …. We had British Heritage Pass which meant we could walk into any old building or garden free of cost. 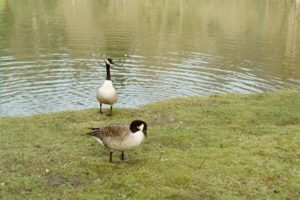 It would otherwise cost may $$ to walk into each site. We personally love history and art. Stourhead Garden is one of my favourite landscaped gardens. It was designed and laid out by Henry Hoare II from 1741 to 1780, based on inspirations he gathered during travelling through Europe and particularly Italy in the 1730s. Several temples based on classical examples are scattered around the central lake.The website photos were taken in early June 2001, you can see the rhododendrons flower in several of them. These are actually a later addition to the garden by later generations of the Hoare family. Especially Sir Richard Colt Hoare introduced exotic trees and shrubs. 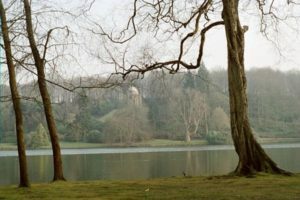 Stourhead was the perfect realization of the eighteenth-century yearning for a Vergilian and Claudian Arcady. 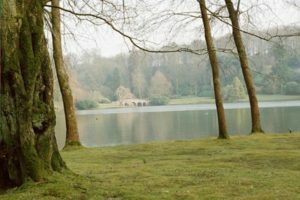 The Stourhead park was created in a luxuriant valley, which Flitcroft made into a lake with a path around it that provided a sequence of Picturesque views and encounters with temples, statuary, springs and grotto, all involving layers of visual, literary, and even personal allusion. 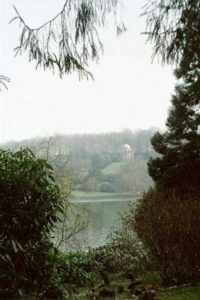 One of the principal Picturesque views at Stourhead is known to reflect Claude Lorrain’s Coast View of Delos with Aeneas and the passage from Vergil on which it was based, relating Aeneas’s account of his experience in the Temple of Apollo at Delos…The architectural set-pieces, each in a Picturesque location, include a Temple of Apollo, a Temple of Flora, a Pantheon (from the Claude painting), and a Palladian bridge. Various parts from the website above have been used to highlight details of the various photos used in this post. Then you come upon the view of one of the lakes. 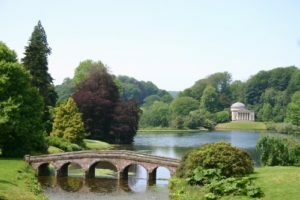 A short stroll from Stourhead House, lying in secluded privacy in the adjacent valley, is one of the finest landscape gardens in the world, quite often referred to as ‘Paradise’. 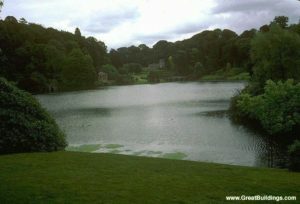 Stourhead garden was created by Henry Hoare II in the 1740s. 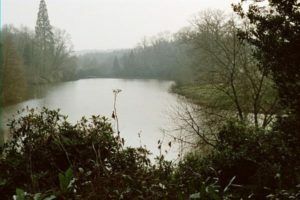 The River Stour was dammed to form a great lake. Around the lake Hoare laid out a landscape garden to entrance his guests with stunning views and pacify them with serene walking pleasure. 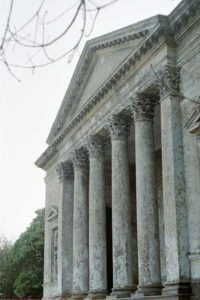 As the garden developed, he added classical features, such as the Temple of Flora, the Pantheon, the Temple of Apollo and Gothic ruins to enhance the series of splendid and unexpected vistas. Such was the accomplishment of this wondrous garden that Henry Hoare II became known as ‘Henry the Magnificent’. 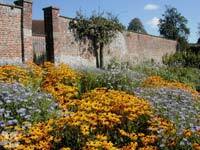 Hoare’s successors cherished his brilliant original conception, while enriching it with new planting. Today, Stourhead is essentially the same as Henry II’s vision – a self-contained and timeless masterpiece. Henry ‘the Magnificent’ was one of a small group of early eighteenth-century ‘gentleman gardeners’ using their acres to create a particularly personal landscape which expressed their hopes and beliefs about the world and their journey through it. His vision, recreating a classical landscape, depended on water. 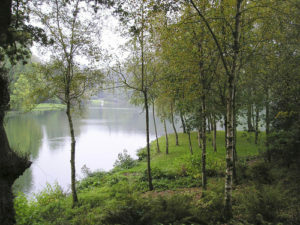 The centre piece of the garden at Stourhead is the lake, which dictates the path you take and the views you enjoy. The damming of the river and the creation of the lake was an ambitious undertaking. 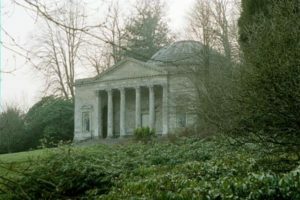 Henry ‘the Magnificent’ and his architect Henry Flitcroft planned it before work began on the garden buildings such as the Temple of Flora, Pantheon and Grotto. 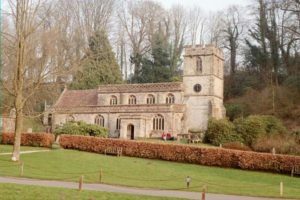 The original planting of the garden was undertaken by a team of 50 gardeners, who planted and tended beech, oak, sycamore, Spanish chestnut, ash and holm oak. 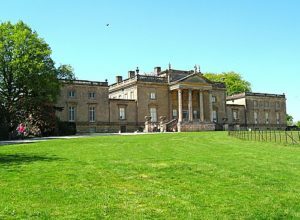 When Sir Richard Colt Hoare inherited the garden, he made changes to his Grandfathers design including removing some of the structures in the garden such as the Chinese Umbrella, Turkish Tent and a Hermitage on the path to the Temple of Apollo. From 1791 onwards he also added to the planting with many more trees such as birch, horse chestnut, tulip and ash as well as underplanting with laurel and rhododendron, which gives us the garden we know and love today. The garden team consists of the Head Gardener, Assistant Head Gardener and four full-time gardeners, aided by two National Trust trainees, a college placement and many volunteers. 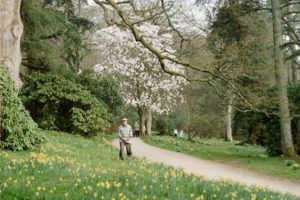 Their aim is to present this natural paradise at its best to the 350,000 annual visitors, whilst also caring for the walled gardens and greenhouses near Stourhead House. Their challenge is to balance the needs of visitors with those of conservation. The House Lawn is its own tranquil garden. It is bordered by many species of rhododendron and flanked by different species of oak on one side, and giant redwood trees from America on the other. Walking away from the House towards the garden you are confronted with an unparalleled view of St Peter’s church in the valley below. 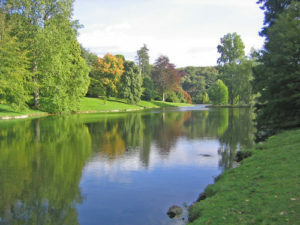 Stourhead was at the forefront of the 18th-century English landscape movement. Earlier in that century, British garden designers were still following the French model of straight vistas and manicured flowerbeds. The fashion to mirror the stifling formality of the French court in its gardens soon lost appeal, and design turned instead to gardens that celebrated the beauty of nature. Many of the ideas for this landscape movement were generated by men enticed by the scenes of the Grand Tour of Europe. 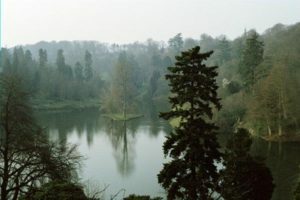 Henry Hoare II, inspired by the views of Italy captured by artists in paint, decided to create a landscape garden at Stourhead that would bring art to life. Stourhead garden changes with the light levels and position of the sun. The Pantheon may catch your eye one minute; then as the sun emerges from behind a cloud, the tulip tree on the island is bathed in light, followed by the Temple of Apollo. The view from the Pantheon looks back toward the Temple of Flora, the Palladian bridge and the ancient parish church of St Peter’s, set remarkably against a panoramic bank of exotic trees. The cavalcade of breathtaking vistas from around the garden surprise, inspire and enamour you, in a way that would make Henry Hoare II a proud man. For his garden has matured, and grown into the living work of art he sought to create nearly three centuries ago. We take you on a tour of the garden that follows the original route intended by its founder Henry Hoare II. We start from the Walled Garden, near to the house, and descend into the valley, working our way through trees brought here by intrepid explorers. 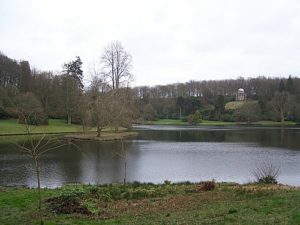 We stop at each of the famous vistas that make Stourhead garden such a wonderful living work of art. The circular Temple of Apollo sits high on a hill at the western end of the garden. 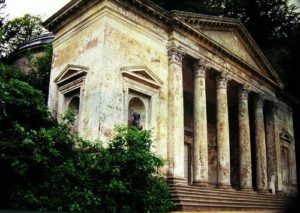 It was inspired by the temple of Baalbec in Syria and built in 1765 by the architect Henry Flitcroft …. Also known as Watch Cottage, this was originally a rustic building. 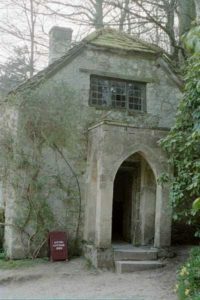 The Gothic seat and porch were added by Richard Colt Hoare in 1806. ‘Gothick’ features were popular additions to functional buildings during this period. 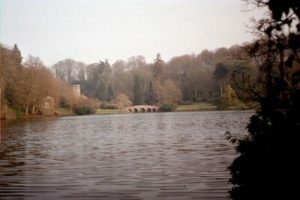 The Palladian Bridge: The bridge was built to create the illusion that the lake is a river, flowing from the village of Stourton down into the valley ……. 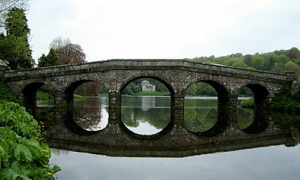 The Palladian Bridge and the Pantheon in the evening light at Stourhead: We end with the classic view out over the lake toward the Pantheon, with the Palladian Bridge in the foreground. 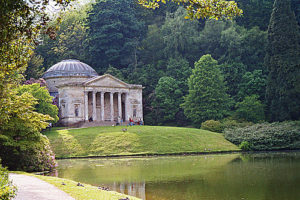 The Pantheon is the largest and most important garden building at Stourhead. 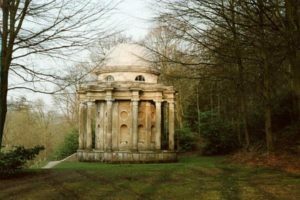 Built in 1753-4 by Flitcroft, it was directly inspired by the great Pantheon in Rome. The interior of the Pantheon contains marble statues of classical deities including the celebrated Hercules by Rysbrack. 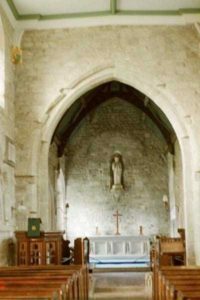 The ancient parish church of St Peter’s …. The old Walled Garden is home to the Pelargonium House. It was erected in 1998 to re-establish the pelargonium collection formed by Richard Colt Hoare in the 19th century. Today we have over 60 varieties. The old Walled Garden once supplied fruit and vegetables to the kitchens of Stourhead House. Vegetables and flowers are still grown here today, and can be purchased at Stourhead Farm Shop …..
Henry ‘the Magnificent’ Hoare II’s ambition was to make Stourhead an unsurpassable place. 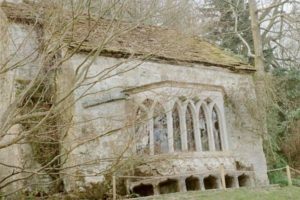 This saw the installation of spectacular garden features, from a medieval cross and classical temples to a cosy cottage and modern ice house. In his own words, ‘those are the fruits of industry and application to business and shows what great things may be done by it…. Dedicated to the Roman goddess of flowers and spring, this temple was the first garden building erected by Henry Hoare II between 1744 and 1746. Over the doorway the Latin inscription reads ‘Keep away, anyone profane, keep away’. Henry asks you to enter his garden in the right spirit. View from the Palladian Bridge to the Pantheon …… the bridge was inspired by the work of 16th-century architect Palladio, this five-arched stone bridge was built in 1762. Although ornamental, the bridge was intended to look practical. It was designed to create the illusion that a river flows through the village and under the bridge. The Obelisk: At the end of the Fir Walk, a long grassy walk laid out on a ridge above the garden, is the Obelisk. 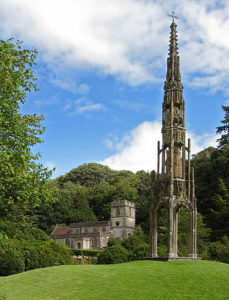 This monument was built in 1839 to replace the decaying original erected by Henry Hoare II in 1746. At its base is a memorial tablet dedicated to Henry, added by Richard Colt Hoare in 1815.